There have been 2 accidents in the past 2 months that I have witnessed the aftermath of at 24th and Broadway. One of these accidents was fatal in which Davis Jefferson was killed. There are warning lights that can be activated by pedestrians, but this is obviously not enough. Please install either a 4 way stop or a traffic light. I am fearful when walking my dog here because cars are driving so fast down Broadway. I live in the building at the intersection and am constantly awoken by screeching tires, revved engines, and now car crashes! This is unacceptable and dangerous. OAK 311 has received this issue. Your service request ID is #899116. Please check back for status updates, or contact us directly at 510-615-5566. OPD what happened to traffic enforcement. I see countless drivers no plates, reckless, speeding inattentive, high, drunk, all at the same time. the front of the car is destroyed. can't miss it. OAK 311 has received this issue. Your service request ID is #894735. Please check back for status updates, or contact us directly at 510-615-5566. OAK 311 has received this issue. Your service request ID is #892346. Please check back for status updates, or contact us directly at 510-615-5566. 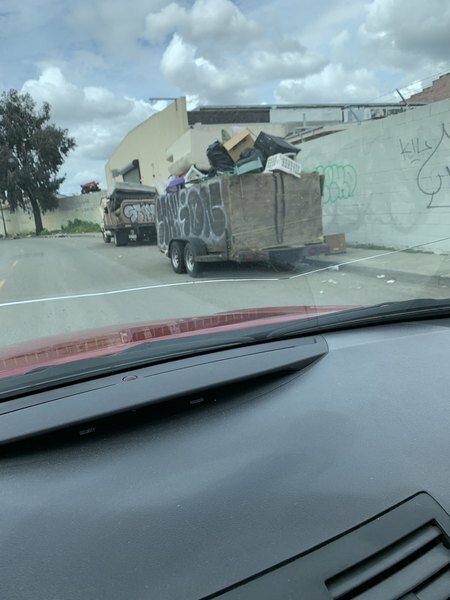 The City of Oakland addressed this issue on 04/24/2019, service request #892346. The city don’t remove those, the men bring those inside the corner ‘s lot of Douglas and Hale I can send the pictures. OAK 311 has received this issue. Your service request ID is #899117. Thank you, in advance, for your patience as we work through a backlog of pothole service requests. Unfortunately the City does not have enough funding to repave all streets in poor condition. With limited funding, our response to resurfacing requests is limited to minor pavement and pothole repairs only. Our Street Maintenance Department will assess your street and determine whether temporary measures might be appropriate. Please understand that this work may be limited to pothole or other minor repairs, and that we have many similar requests. We will do our best to respond in a timely manner. The backlog of streets in Oakland needing pavement currently is $435 million and growing. OAK 311 has received this issue. Your service request ID is #897065. Please check back for status updates, or contact us directly at 510-615-5566. Street light opposite 5911 Ostrander Rd is not working again after last October repair. It went out during the last rain several weeks ago. Perhaps the base is leaking water? Please also see prior work order SR# 850432 for location. OAK 311 has received this issue. Your service request ID is #898100. Please check back for status updates, or contact us directly at 510-615-5566. The bottom of the light is missing a security screw and appears ill fitting which may have had water intrusion or permitted tampering. WIth an Oct 2018 fix, it should not be out again in April '19 in my opinion. The light was worked on today 4/25 with the bulb and unit replaced. However, the light is still not working and it is now 10:20 pm. Possibly restaurant waste dumped on curb. OAK 311 has received this issue. Your service request ID is #899110. Please check back for status updates, or contact us directly at 510-615-5566. OAK 311 has received this issue. Your service request ID is #898772. Please check back for status updates, or contact us directly at 510-615-5566. OAK 311 has received this issue. Your service request ID is #899003. Please check back for status updates, or contact us directly at 510-615-5566. Anyone checking for receipts for all this stuff???? Related you tube "Is Seattle Dying" Oakland is right there. OAK 311 has received this issue. Your service request ID is #899102. Please check back for status updates, or contact us directly at 510-615-5566.